Tensile test stage; Gatan Micro-test 2000. Cryo System; Quorum Technologies PP3000 (temp. range down to -190C). 120 kV TEM with Gatan Orius. 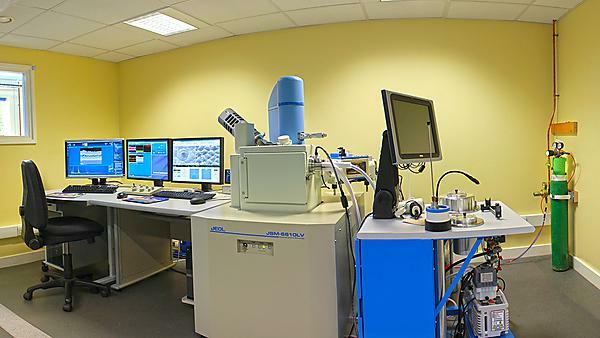 Other preparation and support facilities include a range of optical microscopes, macro-imaging, critical point drying and coating systems. Samples can be coated in gold, carbon, palladium or chrome in-house. Specimens can be cut/polished also in-house for geological or materials analyses in either the rock preparation lab (Brunel Laboratories) or mechanical engineering preparation lab (Smeaton Building) by technical staff. A Buehler Virbomet 2 automatic vibratory polisher is also available for polishing to an EBSD-standard and equipped with specimen holders for standard grain mounts and thin section work. Accelerating Voltage: 0.3 – 30 kV. Accelerating Voltage: 40 – 120 kV. To book time on the equipment, please contact a member of our team on emc@plymouth.ac.uk.